This article is about saplings from loggable trees. For saplings from fruit trees, see Fruit Trees. Saplings have a chance of dropping when breaking their respective Tree's leaves, and regenerate naturally in areas where the trees were present upon world generation when the temperature is above 20 degrees, and the grass block has line of sight directly up to the sky. Note: Sequoia saplings do not drop from leaves, but still regenerate in natural Sequoia Forests. Acacia and Kapok saplings are only available by cheating them in. Using a scythe makes sapling gathering more efficient by destroying a 3x3x3 area of leaf blocks at once, centered at the broken block. Using the Scythe decreases the drop rate of saplings from 6% to 4%. 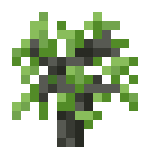 Saplings can grow on any dirt or grass block into a tree after they have been planted for a certain amount of in-game days depending on the type, and have at least a light level of 9. No matter the size of the trunk, only one sapling is required for the tree to grow. Saplings can be placed in tight clusters instead of spaced out for wider trees such as Willow for farming. Once the first tree is chopped down, a second should quickly sprout. For narrower trees such as White Cedar and Douglas Fir, it is suggested to space the saplings at least 1 block apart for maximum leaf generation to harvest more saplings. Sapling drop rate changed from 1% to 4%. Sapling drop chance (hand) is now 6% from 4%. Sapling drop chance (scythe) is now 4% from 3%. Saplings track when they were planted and they grow at varying speeds based upon the tree. Trees take a minimum of 7 in game days to grow from a sapling. Saplings for trees may rarely sprout from nothing in the wild if the conditions for growth are met. Grass and sapling growth will only occur if the temp is greater than 20C. Random sapling growth requires a clear line of sight to the sky. Snow no longer replaces saplings. This page was last modified on 8 June 2015, at 23:46.